Today I want to share with you the story of my dear pet dog, that is now very sick and is dying. Hopefully the life of my beloved doggie would serve as a learning for all. 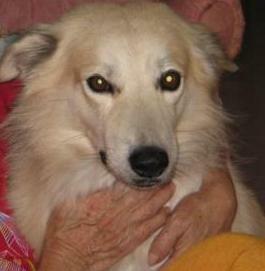 In year 2002, my mom went to visit some relative and a small white puppy ran towards her out of nowhere. And she took him back home and named him Prosper. True to his name, Prosper literally prospered- in weight. 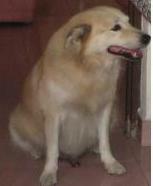 He become a really fat dog- most of the time, people who saw him thought that he was a female dog who was spayed. Those who came over wondered why Prosper is so fat. We had never spayed him. And Prosper did not consume a lot of food. In fact, because we knew of his size, we gave him less food. Despite of that, he never seemed to be able to lose weight- he only time he went a little thinner was when my mom was away for 2 weeks on holiday- during that time I was told that he had no appetite (hardly ever happens) and looked very depressed. He was also sitting near the main door, sadly constantly looking outside…as if looking out for my mom to walk through the door. When my mom came back, he was immediately back to his cheerful self and gobbling down food with vigor. He could have also remained obese because he disliked to exercise- the only time he moved is when he was following my mom around. He totally adored her, as you would see in the photo below, he was looking at my mom and waiting for her to get up from her afternoon nap. His expression is always endearing (probably due to the partial Golden Retriever genes in him). Because of his obvious weight problem (as you would have undoubtly see from his photo), and the fact he had legs that were too skinny to support his body, eventually it became uncomfortable for him to get up. The only time was when there was a cat or some stray dogs nearby that got him charging out to shoo them away from ‘his territory’. When you get back from a stressful day at work and look at Prosper, you would feel half your stress melt away. In fact, I believe Prosper played an enormous role in cheering up my mom and keeping her company during the vital years as my mom was recovering from cancer. He endearing way he stared at her and following her around really made not only her, but everyone around more cheerful. He was there for her when my mom lost 3 sisters within the span of 5 years (due to cancer and stroke). Situation started to change after we got another puppy last year. Initially the pup was sick but after treatment, he got so much better and grew to be a hyperactive fella. He started to fight with Prosper for everyone’s attention. Prosper, being fat and clumsy never got around fast enough and was constantly intercepted by the newcomer. When Prosper used to have exclusive rights to carry the grocery bag and newspaper in the morning, our new addition had ‘snactched’ the role from him. We had no idea how the effect it was having on Prosper. Within months, his health deteriorated. His weak legs, which did not give him much of an issue till then, started to gave way. In no time, his front left paw seemed to be injured- we took him to the vet. The vet asked him to lose weight and to give him some supplements. “I’m also suffering like your dog- being obese with legs like a stick. Now I also have difficulty walking and it gets painful after I stand up too long. Nothing much can be done, the only way is to get him to lose weight and put him on some glucosamine tablets.” (yes, the vet himself is also very much overweight- but an honest and kind man. He does not want to make ’empty promises’ and charge for any unnecessary treatment that he felt would not help). When we did that and his paw seemed to get worse, we took him again to the vet. He said that since the dog was already about 8 years, there was no point of putting him through the agony of operation. It may or may not help. Because of the pain, Prosper started to lie on his back- it looks unnatural- like a fish with an overturned bloated stomach….and we all know what it means when we see an overturned fish in an aquarium. It worries me as I felt it was a bad sign. But I did not know what to do. If dogs are in pain, it’s hard to figure out- because they can’t complain. By that time it happened, it was too late to get him to exercise- since his paw was gradually losing function as if the nerve’s dead. When he lied on his back and we wanted to move him, he would squeak in pain- so we left him alone. Then Prosper started to have labored breathing and was salivating. It seemed like he was trying to belch or vomit but nothing except saliva and clear looking fluid came out. And when he did sort of burped, some unpleasant smell came out from his tummy. By the second night that happened when he was lying next to me as I was working on my blogs, I tried to search the net and came across this article. So I took him to the vet clinic (for the 3rd time) since from the internet search, it looked as though Prosper could be having a stomach bloat and that could endanger his life. The usual (overweight) vet is unwell due to chest infection and is now walking with the help of a stick- I was also concerned for this kind old man. He could still make his usual joke with his belly laugh “now I am also having the same problem as your dog” before he inserted a tiub to his own nose that is attached to a portable machine (I was told later that he had a chest infection and was just discharged from the hospital). Prosper was attended by another vet (likely his friend). The attending vet told me that Prosper is in a lot of pain and yes, his stomach is bloating- because his vital organs like lungs and heart are not functioning properly. That would be what that caused the bloating. It’s a matter of time when the organs around would fail. Even if he could prescribe a special medication (which cost about RM200 plus), it would only prolong his life …and suffering for a few more months at most. As such, he did not encourage me to put Prosper on that medication. There is no point of operation as he said Prosper would not survive the anesthetic due to his health condition. The only thing we could do was to get him to lose weight and it would make it easier for him to move ….now that his front paw is completely paralysed. And to put him on a special diet for obese/ senior /dogs with health problems- to make digestion easier for him. But then, the vet was not optimistic that Prosper would fully recover because Prosper’s vital organs were already failing. Sad as it may be, none of us could turn back time. Prosper has always been a therapeutic pet- his size and disposition seemed to have a kind of effect on people like big bellied Santa has on kids. He had been there for the family during our difficult time. 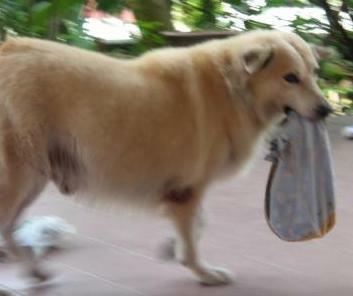 That is why I hope that for anyone out there who have overweight/obese pet, please try to get your dog to lose weight. Take the time to exercise with the dog- some dogs would not exercise even if there is a huge garden- you need to get him/her moving. If the dog can’t seemed to lose weight, put in on a special diet- that can be prescribed by vets. I remember few years back, my neighbor had this overweight spayed female fox terrier. The dog had started to develop difficulty walking due to her size (similar to Prosper, she had huge body but skinny legs). When my neighbor told us that he is putting her on a special diet prescribed by the vet and giving her exercise, we did not think it would work (that was years before Prosper developed similar problem). But recalling back, I remembered that the initial stage, the dog was walking with a lot of difficulty- my neighbor had to nudge and encourage her to walk. I could see them walking as they would pass my house in their walks. A few months went pass- the dog seemed to have lose a little weight (somehow she never could be skinny) but could walk without much difficulty. So it worked after all, just that like my neighbor, you need to be patient and do not be discouraged when initially you do not see immediate improvement. Some dogs could be predisposed to being overweight- probably due to their warm and cuddly nature. Even though they could never be thin, invest the additional money to put them on a special diet. And take time to give them a walk- because they may be too lazy to exercise based on their own initiative (pretty much like humans, sometimes). And, always pay attention to the dog. Usually, such overweight dogs are sensitive in nature- it could be detrimental to their emotional health if they felt that they are no longer loved or if their ‘special place’ has been snatched away. Even though my mom has always loved Prosper very much, the little one does want a lot of her attention. Like humans, some dogs can be very emotional and sentimental- and when they feel neglected (but they are not), their health would go downhill quickly. Still, if Prosper had been fit and active, he would have stand a much better chance to recover when it comes to any illness. Because he had been so inactive for most part of his life, it made it hard for him to get better. I am still praying and hoping that he would recover- but we had no choice but to be prepared for the worst. I only hope by sharing the life story of Prosper, pet owners would react early to reduce the weight if their dogs are obese and try to get the dog some exercise. Also if your dog has a stomach that is more huge than normal, please take the dog to see the vet- it could be worms, or bloating caused by internal organ problems. Early intervention could save your pet’s life. 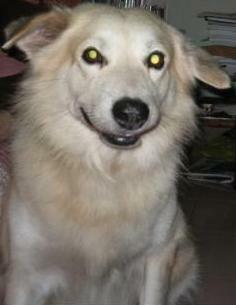 For full listing of articles related to Pets, please go to http://healthblog.yinteing.com/main/pets/. How is Prosper doing now?! We just recently adopted a new dog and the owner said she needed to lose 20 pounds. We’ve put her on a diet and are walking/running her every morning and she gets no treats. Glad to know you’ve placed your doggie on a diet and exercise. It’s important for the dog’s health. Sadly, Prosper had passed away last March. Wish we had taken action earlier.